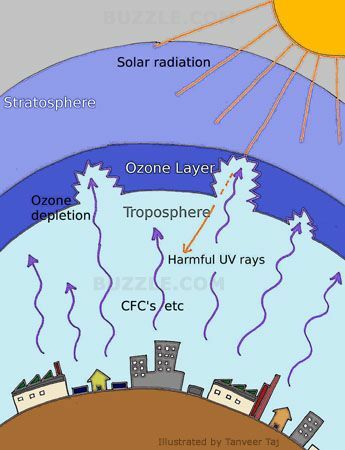 Ozone hole – There is a thick layer of ozone gas which is placed in the upper atmosphere and acts as a protective for the harmful ultra-violet rays. Due to the ozone layer is present in the upper atmosphere preventing the majority of the ultra-violet radiations coming from the sun. This highly useful ozone layer in the upper atmosphere has been threatened and harm by rise in human activities for the increase in the use of chemical known as chloro fluoro carbon (dichloro-difluoro methane) through the AC’s, Refrigerator and many more devices which emit this chemical. History of Ozone Hole – Scientists observed a hole in the ozone layer that covers the upper atmosphere in 1980. This ozone hole was identified over the region of Antarctica. The ultra-violet rays which were previously approximately wholly blocked by this ozone layer can currently go into the earth’s lower atmosphere to some extent through this ozone hole. This will regularly raise the level of ultra-violet radiations reaching the earth’s surface. High levels of this ultra-violet radiation are harmful to nearly all forms of life. Effect of Ozone Hole -The main shortcoming of the ultra-violet rays that is it can cause a skin cancer. The effect of rise in ultra-violet radiation on the surface of earth due to ozone hole might be a raise of skin cancer along with men and animals. The extreme ultra-violet radiation also harms the plant. The main cause for the depletion of ozone hole is the use of chloro fluoro carbon. The chloro-fluoro-carbons are used in spray cans and as refrigerants react with the ozone layer and damage it. Since the chloro-fluoro carbons deplete the useful ozone layer, so the use of this chemical is banned in the entire world for protect the ozone layer. The emissions which are produced by supersonic jet airplanes and nuclear explosions also cause the depletion of ozone layer in the upper atmosphere.